Over the past seven months, Unit 42 has been investigating a series of attacks we attribute to a group we have code named “Scarlet Mimic.” The attacks began over four years ago and their targeting pattern suggests that this adversary’s primary mission is to gather information about minority rights activists. We do not have evidence directly linking these attacks to a government source, but the information derived from these activities supports an assessment that a group or groups with motivations similar to the stated position of the Chinese government in relation to these targets is involved. The goal of this report is to expose the tools, tactics and infrastructure deployed by Scarlet Mimic in order to increase awareness of this threat and decrease its operational success through deployment of prevention and detection countermeasures. From our vantage point, we are not able to identify which attacks have been successful against which organizations. But the fact that the tools Scarlet Mimic deploys have been under development for years suggests an active adversary that has been successful in some percentage of its operations. Based on our analysis, we are also seeing Scarlet Mimic start to expand its espionage efforts from PCs to mobile devices, marking an evolution in its tactics. Individuals and groups of all different types may become the target of cyber espionage campaigns. The most well known victims of cyber espionage are typically government organizations or high-tech companies, but it’s important to recognize that espionage-focused adversaries are tasked to collect information from many sources. The attacks we attribute to Scarlet Mimic have primarily targeted Uyghur and Tibetan activists as well as those who are interested in their causes. Both the Tibetan community and the Uyghurs, a Turkic Muslim minority residing primarily in northwest China, have been targets of multiple sophisticated attacks in the past decade. Both also have history of strained relationships with the government of the People’s Republic of China (PRC), though we do not have evidence that links Scarlet Mimic attacks to the PRC. Scarlet Mimic attacks have also been identified against government organizations in Russia and India, who are responsible for tracking activist and terrorist activities. While we do not know the precise target of each of the Scarlet Mimic attacks, many of them align to the patterns described above. The Scarlet Mimic attacks primarily center around the use of a Windows backdoor named “FakeM.” It was first described by Trend Micro in 2013 and was named FakeM because its primary command and control traffic mimicked Windows Messenger and Yahoo! Messenger network traffic to evade detection. We have identified two subsequent variants of the FakeM family, which has undergone significant changes since it was exposed in 2013. We have also identified nine distinct “loader” malware families, which Scarlet Mimic appears to use to avoid detection when infecting a system. In addition to the FakeM variants, Scarlet Mimic has deployed Trojans that target the Mac OS X and Android operating systems. We have linked these attacks to Scarlet Mimic through analysis of their command and control (C2) infrastructure. To infect individuals with access to the data the actors desire, Scarlet Mimic deploys both spear-phishing and watering hole (strategic web compromise) attacks. Using these tactics they can directly target previously identified individuals (spear phishing) as well as unidentified individuals who are interested in a specific subject (watering hole). 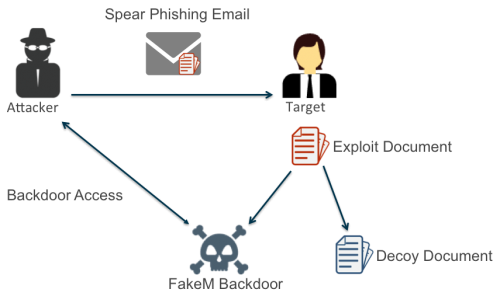 In their spear phishing attacks, Scarlet Mimic has exploited five separate vulnerabilities. However, in many cases they chose to forgo exploiting a software vulnerability and used self-extracting (SFX) RAR archives that use the Right-to-Left Override character to mask the true file extension, tricking victims into opening executable files. As with many other attackers who use spear-phishing to infect victims, Scarlet Mimic makes heavy use of “decoy” files. These are legitimate documents that contain content relevant to the subject of the spear phishing e-mail. After the system is infected, the malware displays the decoy document to trick the user into believing nothing harmful has occurred. These decoy documents allow us to identify the theme of the spear phishing e-mail and in some cases the target of the attack. The most recent Scarlet Mimic attacks we have identified were conducted in 2015 and suggest the group has a significant interest in both Muslim activists and those interested in critiques of the Russian government and Russian President Vladimir Putin. Based on their previous targets we suspect these individuals may be targeted based on the information they posses on activist groups. The better we can understand the threats to our networks and systems, the more effective we will be at preventing those threats. The goal of this report is to help network defenders better understand attacks from a group we have named Scarlet Mimic. This group has been conducting attacks for at least four years using a backdoor Trojan that has been under active development. The group primarily deploys spear-phishing e-mails to infect its targets, but was also responsible for a watering hole (strategic web compromise) attack in 2013. Attacks from this group have been reported publicly in the past, but mostly as disparate, unconnected incidents. Based on analysis of the data and malware samples we have collected, Unit 42 believes the attacks described herein are the work of a group or set of cooperating groups who have a single mission, collecting information on minority groups who reside in and around northwestern China. In the past, Scarlet Mimic has primarily targeted individuals who belong to these minority groups as well as their supporters, but we’ve recently found evidence to indicate the group also targets individuals working inside government anti-terrorist organizations. We suspect these targets are selected based on their access to information about the targeted minority groups. In the following sections we will describe selected attacks we have identified and who their likely targets are. We will also provide detailed analysis of the latest variants of the malware they deploy (known as FakeM) as well as other associated tools that allow Scarlet Mimic to target Android and OS X devices. Attacks launched by this group were publicly exposed on 2013 in a Trend Micro report about the FakeM Trojan. Since that reports release, Scarlet Mimic has deployed two additional versions of the malware. They have also deployed nine separate “loader” Trojans they use to infect systems with their backdoor. The majority of attacks we associate with Scarlet Mimic follow the pattern shown in Figure 1. The attacker sends a spear-phishing e-mail with a subject and body content that appeal to the targeted user. This e-mail carries an attachment, which is typically a document that exploits a Microsoft Office vulnerability. The attachment uses a file name that is related to the e-mail content to trick the user into opening it. If the user opens the file and the exploitation is successful, a backdoor Trojan is installed on the system that gives the attacker access and a decoy document is displayed to the victim. Decoy documents are typically non-malicious versions of the content the user expected to see when opening the attachment. Many of the targets and spoofed or compromised sending e-mail addresses have contact information on the Internet. The apparent sender email usually appears to be someone associated with the accompanying text, when appropriate, while the target emails are usually also available online tied to target organizations. A small subset of the decoys could not be found online and may be from previous compromises by Scarlet Mimic. Many attackers deploy this particular pattern, as it is often successful at infecting a user without alerting the user of the infection. This is the exact same pattern, for example, deployed by the attackers in Operation Lotus Blossom. We have identified spear phishing documents from Scarlet Mimic exploiting the following vulnerabilities. We also know Scarlet Mimic uses a number of toolkits to create documents that contain exploit code to install the FakeM payload on a compromised system. Unit 42 tracks the toolkits delivering FakeM under the names MNKit, WingD and Tran Duy Linh. These kits appear to be used by many attack groups, and they alone are not a good indication of Scarlet Mimic activity. Even when no software vulnerability is exploited, the attacks still typically include a decoy document. The content of most of the decoy documents appear to be available on the open Internet, and the attackers typically made small modifications to them. Many of the targets and spoofed or compromised sending accounts have contact information on the Internet. The apparent sender email usually appears to be someone associated with the accompanying text, when appropriate, while the target emails are usually also available online tied to target organizations. A small subset of the decoys could not be found online and may be from previous compromises by Scarlet Mimic. The overarching decoy themes were Uyghur-related, anti-Putin, or Al-Qaeda-related. The decoys are often copied from think tanks or reputable news sources the targets would likely frequent. In one instance, the threat actors used content from a New York Times article (Figure 2) on the same day it was published. Figure 3 shows one of the more common themes used to target Uyghurs and those interested in their cause. Multiple attacks used press releases or other content related to the World Uyghur Congress. 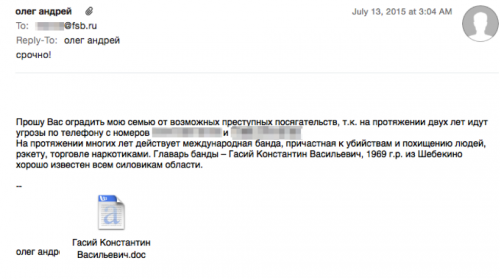 In July of 2015, we identified a full e-mail uploaded to an antivirus scanning service that carried a Scarlet Mimic exploit document. In this case (Figure 4) the recipient of the e-mail was an individual working for the Russian Federal Security Service (fsb.ru). The e-mail body requests help dealing with threatening phone calls from an international gang. 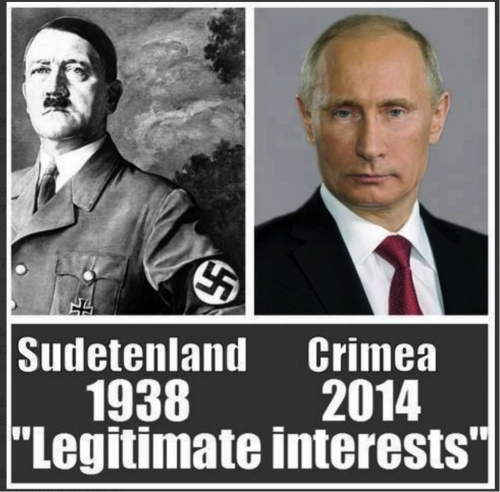 Another attack, sent to an unknown target carried a decoy image (Figure 5) that compared Russian President Vladimir Putin to Adolf Hitler. In yet another case, the threat actors used a conference notification from one organization (Figure 6a) and modified it to appear as thought it was for an “Islamic Country Muslim Religion Conference” (Figure 6b). This document was particularly poorly altered, as the registration form still contained multiple hints to indicate the document was fraudulent (Figure 6c). In total we have collected over 40 individual decoy documents used in these attacks, far more than we can detail here. We are aware of one case where Scarlet Mimic broke from the spear-phishing pattern described above. In 2013, the group deployed a watering hole attack, also known as a strategic web compromise to infect victims with their backdoor. The watering hole is an attack vector that involves compromising a website that targeted victims are likely to visit in order to infect and gain access to their systems. According to a blog by Websense, threat actors compromised the Tibetan Alliance of Chicago’s website to host malicious code that exploited a vulnerability in Internet Explorer (CVE-2012-4969.) Microsoft patched this vulnerability in September 2012, suggesting that this watering hole attack used an older vulnerability, which aligns with the threat groups continued use of older vulnerabilities in their spear-phishing efforts. First discussed in January 2013 in a Trend Micro whitepaper, FakeM is a Trojan that uses separate modules to perform its functionality. FakeM’s functional code is shellcode-based and requires another Trojan to load it into memory and execute it. There are a variety of different Trojans used to load FakeM, some of which are more interesting than others. In this section, we will explore the loader Trojans followed by an analysis of the evolution of FakeM itself. We end this section with a discussion on tools related to FakeM and used by Scarlet Mimic. It appears that the threat actors include the loader Trojans in some sort of builder application that allows actors to quickly create, configure and deploy payloads to execute FakeM. We believe this because many samples that execute FakeM have the same exact compilation time but different C2 servers, as seen in the example in Table 1. This suggests the actors compile a single sample and use a builder tool to configure individual samples on demand. We used the loader Trojans to provide a general timeline for the development of FakeM samples, as FakeM is shellcode-based and does not contain any usable timestamps. The timestamps in the loader Trojans does not necessarily correspond to the usage of FakeM, but plotting the compile times of the loaders on a timeline shows an interesting trend. The scatter plot timeline in Figure 7 shows the known compilation times of the loader Trojans and the FakeM variant that it executed. Based on the timeline, it appears that the actors were actively developing several of the loaders at the same time from 2009 until the early months of 2014. After the first quarter of 2014, it appears that the actors abandoned development of the older loaders in favor of FakeFish, BrutishCommand and SubtractThis. This does not mean that actors will not continue to use the older loaders, but it does suggest that the actors will continue including the newer or freshly developed loaders in updated builder applications. The timeline also presents the possibility that the FakeM developers reacted to the release of Trend Micro’s FakeM blog and whitepaper. 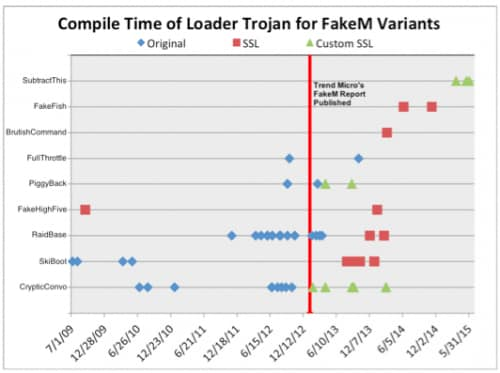 Trend Micro published their analysis of the FakeM Trojan on January 17, 2013 (marked in Figure 7 by a red line) that discussed the original variant of FakeM. Shortly after, the original variant of FakeM drops off the timeline in favor of the SSL and Custom SSL variants. It is possible that the FakeM developers saw their tool was exposed and adapted it to avoid detection for continued use as a payload in attacks. We cannot be certain if the developers reacted specifically to Trend Micro’s content, as it is possible that they were reacting to the increased antivirus detection rate of their tool that resulted from the exposure of the tool. Regardless of the specific stimulus, the reaction shows that the FakeM threat actors evolved to avoid detection/attribution and to continue their attack campaigns. The timeline does have one noticeable outlier, specifically the FakeHighFive sample compiled in September 2009 that loaded a FakeM SSL sample. We believe this compile time is incorrect, as the C2 domain for this sample, specifically press.ufoneconference[. ]com, was registered by the threat actor in February 2013. The registration of the C2 domain in February 2013 aligns with other compilation times of FakeM SSL, which leads us to the conclusion that the September 2009 compilation timestamp was modified and/or inaccurate. Most of the related loader Trojans, such as CrypticConvo, PiggyBack, FullThrottle, FakeHighFive, FakeFish and RaidBase do little more than load encrypted FakeM shellcode (either from a PE resource or embedded data), decrypt it, and execute the resulting shellcode. Other related loading Trojans, such as SubtractThis, BrutishCommand and SkiBoot employ clever techniques worth discussing. Calls TranslateAcceleratorA to check Windows message received is VK_SUBTRACT “-“. Calls the callback function set up in the SetTimer function if the user enters the minus “-“ key. This technique requires user interaction, which makes analysis in sandboxes more difficult. The BrutishCommand loader uses a very interesting method to decrypt the FakeM functional code. The main function in this loader checks the command line arguments passed to it, and if there are none present it will obtain a random number between 0-9 and create a new process using the same executable with this random number as a command line argument. If the executable has a command line argument, the Trojan subjects the value to a hashing algorithm and compares the hash to 0x20E3EEBA. If the value matches the static hash, the executable will subject the command line argument to a second algorithm that will produce a value that the Trojan will use as the decryption key to decrypt the embedded FakeM shellcode. It essentially brute forces its own decryption key by rerunning itself over and over until it runs with the correct value is provided on the command line. Unit 42 had not seen this technique used by other malware families and it introduces a challenging hurdle when attempting to analyze or debug the loader Trojan. SkiBoot reads the master boot record (MBR) of the system to determine the XOR key that it will use to decrypt the FakeM shellcode. It carries out this functionality by calling the ReadFile function to read 512-bytes from “\\.\PHYSICALDRIVE0” and specifically uses the last byte of the MBR as the encryption key. The last byte of the MBR is “\xAA”, or the second byte of “\x55\xAA”, which is the boot signature portion of the MBR. Instead of using ReadFile, one variant of this loader reads the MBR using DeviceIOControl using the ID_CMD control code, and accesses a specific offset to obtain the value that it will rotate each byte in the ciphertext within the decryption algorithm. The significance of using DeviceIOControl is that the VMware hypervisor responds to this API call with a blank buffer instead of the MBR, whereas the Virtualbox hypervisor returns the MBR correctly. It appears that this loader is specifically using the DeviceIOControl API function as a VMware detection technique, suggesting that the developers are well versed in the nuances of the VMware hypervisor and virtual machine evasion. Since being originally exposed in 2013, authors of FakeM have continuously made changes to the FakeM codebase, resulting in multiple variants. Before elaborating on the different variants of FakeM, there are many similarities that remain throughout the various iterations. The architecture has not changed during the evolution of FakeM, as a modular framework exists in each variant, as seen in Figure 8. The FakeM main module is responsible for launching embedded modules, such as a keylogger or for gathering sensitive files. The main module is also responsible for communicating with its C2 servers and handling commands issued by the C2 server. All FakeM variants initiate communications with its C2 server and check the C2’s response for a command. Also, all FakeM variants share a common command handler with the same capabilities, as seen in Table 2. The limited command set suggests that FakeM’s functionality is obtained by additional assembly code provided by the C2 server with the 0x211 command. According to Trend Micro’s initial analysis on FakeM, threat actors delivered and ran additional code that provided further capabilities to the Trojan, such as the ability to run shell commands, steal passwords, capture the screen and upload files. 0x211 Run assembly code directly from the C2. 0x212 Idle. Attempts to receive another command immediately instead of sleeping for 30 seconds. 0x213 Sets a flag to end the session with the C2. This will force the Trojan to reestablish a session with the C2. Now that we have covered the commonalities between FakeM variants, the following sections will dive into the specific variants of FakeM. Unit 42 categorizes the different variations of FakeM based on the method used to communicate with the C2 server, which has changed dramatically over the years. The original variant of FakeM generates network beacons to its C2 server that begin with a 32-byte header that in most cases is meant to blend into network traffic generated by legitimate applications. Following this 32-byte header, the original variant of FakeM includes data encrypted using a custom encryption cipher that uses an XOR key of “YHCRA” and bit rotation between each XOR operation. The original variant includes the FakeM discovered and published by Trend Micro in 2013, in which the authors of FakeM first attempted to evade detection of its C2 communications by pretending to be generated by legitimate messenger applications, such as MSN and Yahoo! messengers. Figures 9 and 10 show FakeM attempting to resemble MSN or Yahoo! Messenger traffic, as the first 32-bytes contain data that resemble legitimate traffic generated by these chat programs. In addition to emulating chat programs, FakeM has also included HTML code within the 32-byte header. As you can see in Figure 11, the overall structure of the beacon did not change, rather the only differences is the data in the header contains HTML tags. The HTML data in the header led Unit 42 to a whitepaper published by Malware.lu that suggested the MSN, Yahoo, and HTML versions of the original variant of FakeM all share a common server application that the threat actors use to build samples and control infected systems. In October 2013, FireEye published a blog about a sample of FakeM that did not use fake messenger or HTML data in the first 32 bytes of the C2 traffic, but instead used four repeating bytes to fill this portion of the packet, as seen in Figure 12. Unit 42 tracks this under the original variant, as it uses the same algorithm to encrypt the data and otherwise shares a common structure to the MSN, Yahoo, and HTML versions with the exception of the modification to the first 32 bytes. While performing infrastructure analysis on FakeM original variants, we came across shared infrastructure with domains that hosted C2 servers for malware samples that did not match the known FakeM communication protocols. Palo Alto Networks WildFire had analyzed many samples associated with these related C2 domains, all of which communicated with the C2 server using secure sockets layer (SSL). To determine the malware family that was generating this traffic, Unit 42 analyzed these samples and found that the functional code was the same as the original FakeM variant. This discovery indicates the authors of FakeM introduced new code to the Trojan in order to use SSL to communicate with its C2 server. The drastic change in C2 channel warranted a new variant name, and we dubbed it “FakeM SSL”. During the analysis of these samples we did not find any operational C2 servers to complete a handshake to establish a SSL session. During the handshake, the FakeM SSL samples will tell the server it supports 36 different cipher suites even though the samples appear to only support one. Unit 42 believes the cipher suite within the FakeM SSL variants uses Diffie-Hellman for key exchange and the RC4 cipher to encrypt the C2 communications. This new variant of FakeM shared the same functional code as its predecessors, but again the communications with the C2 dramatically differed from the other variants. Communications between this variant and the C2 server leverage what Unit 42 believes is modified SSL code, as the code is very similar to the FakeM SSL variant. The code appears to use Diffie-Hellman for key exchange and the RC4 algorithm like FakeM SSL; however, the initial packet sent to the C2 server did not contain a “client hello” message, which is required to initiate an SSL handshake. Instead, the initial packet sent data as seen in Figure 13. This variant of FakeM skips the traditional SSL handshake, which involves an agreement on a cipher suite to use to encrypt communications. The FakeM code only supports one cipher suite, which makes the cipher suite agreement portion of the SSL handshake irrelevant. Instead, FakeM creates a session with its C2 server by exchanging keys. The lack of a valid handshake makes detection of this C2 stream difficult, as the packets sent between the Trojan and the C2 to establish this session contain random binary data. Network devices will also be unable to perform any SSL decryption due to the lack of detection and the inability to determine the cipher suite used to encrypt the data. Figure 14 below provides a visual depiction of the handshake procedure and the subsequent beacon and command messages. The handshake starts with a key exchange, which the Trojan initiates by creating a 2048-byte buffer that it will store its key (128-bytes, followed by null values as seen in Figure 13) and sending its key to the C2 server. 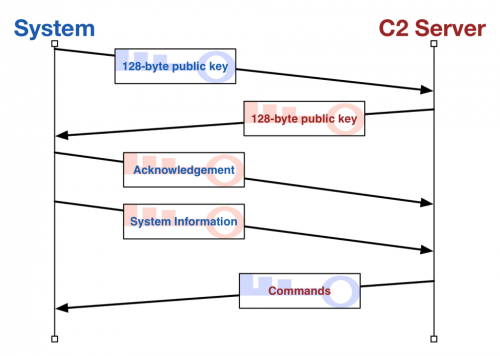 The C2 will respond with its own key (also 128-bytes, followed by null values) that the Trojan will store and use to encrypt future communications. Once this key exchange is complete, the Trojan acknowledges the receipt of the server’s key by sending another 2048-byte packet to the server. To build the acknowledgement packet, the Trojan creates a 2048-byte buffer filled with null values and copies the string “ws32.dll” to offset 8 and encrypts the buffer with the server’s key. The Trojan will encrypt this data using the key provided by the C2 and send it to the server. The Trojan will then wait for the C2 to respond, which it will decrypt and parse for FakeM commands. Unit 42 has been unable extract any plug-ins from C2 network traffic; however, several FakeM custom SSL samples contain embedded plug-ins that run without interaction with the C2 server. Also, Unit 42 was able to extract several modules from the original FakeM server application, as seen in Table 3. All of these modules are shellcode-based plug-ins that would work with the custom SSL variant of FakeM with little to no modification. CallMe is a Trojan designed to run on the Apple OSX operating system. This Trojan was delivered in targeted attacks on Uyghur activists in 2013 and used infrastructure associated with FakeM. In February 2013, AlienVault performed analysis on the CallMe Trojan and found that it is based on a tool called Tiny SHell, an OSX shell tool whose source code is available on the Internet. 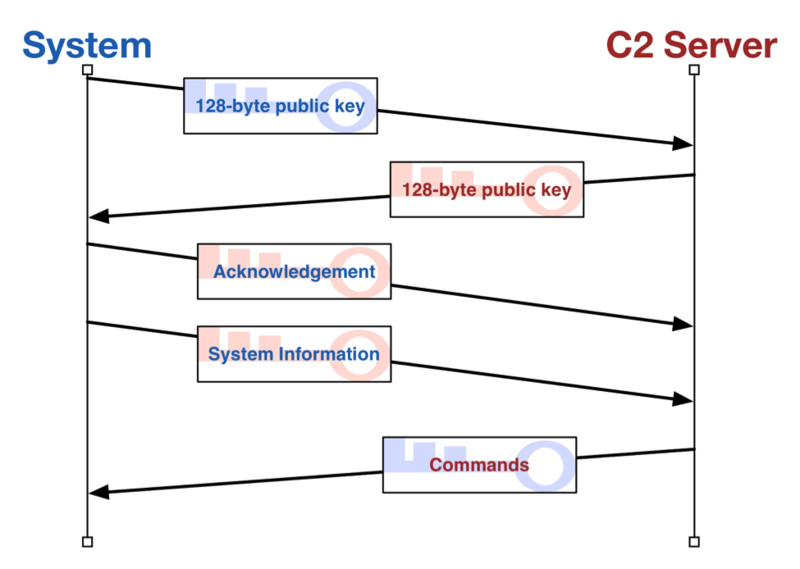 The Trojan uses AES to encrypt the communication channel its C2 server, which will provide one of three commands to carry out activities on the compromised system, as seen in Table 4. 1 Get a file from the system and upload it to the C2 server. 2 Put a file on the system from the C2 server. File is saved to a specified filename in <HOME directory>/downloads/. 3 Create a reverse shell to interact with the compromised system. The infrastructure overlap between FakeM and CallMe involves the fully qualified domain name (FDQN) of “googmail.org”, which was used by both FakeM and CallMe samples. This suggests that not only do these threat actors have the ability to compromise victims running the Microsoft Windows operating system, but they can also target individuals running Apple’s OSX as well. During infrastructure analysis of FakeM Custom SSL variants, Unit 42 found infrastructure overlaps between FakeM and another new, previously unreported Trojan that we named “Psylo”. Psylo is a tool that allows threat actors to upload and download files to and from a compromised system, as well as execute commands and applications on the system. The name Psylo is an anagram from the mutex created when initially running this payload, which is ‘hnxlopsyxt’. Psylo is similar to FakeM in that they are both shellcode-based, and they have similar configurations and C2 communication channels. As you can see from the following two configuration structures, Psylo and FakeM have similar configurations with only the array length of the C2 locations being different. Both use SSL to communicate with their C2 servers, and it appears they share common code to carry out the Diffie Hellman key exchange. We compared the Diffie Hellman code from Psylo with FakeM custom SSL variant and found that they were very similar, but the FakeM samples had some of the functionality within sub-functions, which rendered binary diffing between the two Trojans impossible. Another slight difference involves how Psylo and FakeM generate random numbers for SSL. FakeM uses QueryPerformanceCounter to create a random number, whereas Psylo uses CryptGenRandom, both of which generate random numbers 68 bytes long. Interesting enough is that CryptGenRandom calls RtlGenRandom, which uses QueryPerformanceCounter along with other system attributes to generate a random number. Unit 42 does not consider Psylo another variant of FakeM because Psylo has a command handler that differs dramatically from FakeM. Table 5 shows the Psylo command handler, which suggests it is less modular and supports more embedded functionality when compared to FakeM. It is possible that the threat actors created this Trojan as a standalone alternative to FakeM. 0 Idles for 10 seconds. 2 Enumerate all storage devices. 3 Find all files that starts with a particular string (%s*.*). 5 Creates a file to write to, deleting it if it already exists. Combined with ‘E’ command to download a file to the system. E Writes data from C2 to a file opened using the ‘5’ command. Combined with ‘5’ command to download a file to the system. 6 Reads a file, which effectively uploads the file to the C2. 7 Delete a specified file. 8 Execute a command using WinExec. Responds to C2 with ‘s’ if successful or ‘r’ if unsuccessful. 9 Timestomps. Sets a specified file’s timestamps to match that of a system file in the System32 directory. Another discovery we made while researching this blog is an overlap between Psylo infrastructure and a Trojan focused on compromising Android mobile devices. Unit 42 tracks this mobile Trojan as MobileOrder, as the authors specifically refer to commands within the app as orders. The connection between FakeM, Psylo, and MobileOrder suggest that Scarlet Mimic is now expanding their espionage efforts from PCs to mobile devices, which marks a major shift in tactics. An Android geographical location SDK provided by AMAP. Actor developed code that carries out Trojan’s functionality. The malware uses the AMAP SDK to get accurate location of infected devices by GPS, mobile network (such as base stations), WiFi and other information. MobileOrder acts on instructions provided by its C2 server, which it communicates with over TCP port 3728. All C2 communications are encrypted with the AES algorithm using a key generated by computing five MD5 hashes starting with the key “1qazxcvbnm”, and adding a salt value of “. )1/” in each iteration. The C2 server will respond to requests from MobileOrder with commands that the Trojan refers to as “orders”. MobileOrder contains a command handler with functionality that provides a fairly robust set of commands, as seen in Table 6. The first byte of data provided by the C2 server is order number, which is followed by the encrypted data that needed to carry out the specific order. 24 Order_HostInfo Upload device information including IMEI, IMSI, SIM card serial number, phone number, Android version, device manufacturer, device model, SD card size, network type, device locking status, country, carrier, time zone, language, install app list, browser bookmarks, etc. 27 Order_DownLoad Download specified file to SD card’s Android/data/tmp/ directory. 59 Order_GetLoc Upload information about network operator, MCC, MNC, network type, GSM cell location, CID, LAS, BSSS, etc. This information can be used to locate the device. 60 Order_GetGps Upload GPS location by AMAP SDK. There is some infrastructure overlap in the C2 servers used by almost all of the FakeM variants, as well other Trojans such as MobileOrder, Psylo, and CallMe. There are also infrastructure ties between some FakeM variants and older activity using Trojans such as Elirks, Poison Ivy, and BiFrost, which were used in attacks as old as 2009. The domain names used to host C2 servers are a mix of actor-registered and Dynamic DNS (DDNS,) though most are DDNS. The DDNS domains in turn are linked to a small grouping of ASNs, with one ASN often largely tied to one FakeM variant. Most of the FakeM MSN C2s resolve to IP addresses associated with ASN 22781 (RBLHST – Reliablehosting.com). However, we found one MSN sample that shared infrastructure with some FakeM Custom SSL variants. There is a similar overlap between FakeM MSN, FakeM HTML, and FakeM SSL. The registrant email xsldmt@xj163[. ]cn was used to register several domains used as C2s: yourturbe[. ]org, websurprisemail[. ]com and googmail[.]org. One of these domains was also used in the 2013 CallMe activity at the same time it was being used for FakeM MSN samples. The targeting and decoy style also matches with the FakeM activity. The overlap between Elirks, FakeM SSL, Psylo, and MobileOrder exists entirely in their command and control infrastructure, through domain names and/or IP resolution. Samples of these three used some of the same C2 domains, notably lenovositegroup[. ]com, ufoneconference[. ]com, and websurprisemail[. ]com, while some resolution overlap includes 118.193.212[. ]12, 210.206.219[. ]241, and 59.188.239[.]117. Similarly, some FakeM Yahoo C2 domains and FakeM Custom SSL C2 domains also have overlapping IP resolutions, notably 95.154.204[.]198. This error message suggests that the HTRAN application running on 59.188.239.117 was unable to connect to the real C2 server hosted at 68.71.35.135. Throughout this report, we have referenced multiple previous blogs and white papers, from Unit 42 and others, that have documented elements of this threat in the past. In addition to those documents readers may also find the following publications interesting. In 2014, Citizen Lab released a paper on threats against civil society that referenced some of these attacks as the “Domain Name Family” or DNF. Kaspersky Lab has produced excellent research on attacks against Uyghur and Tibetan activists. In 2013, they identified an Android Trojan that was also targeting these groups. Our analysis indicates this malware is different from the MobileOrder Trojan described above, but they serve very similar purposes. On January 12, 2016, Cylance published a blog linking an exploit document to the group Mandiant refers to as APT2 and CrowdStrike as “Putter Panda.” While there does appear to be a small overlap between IP addresses used in attacks from this group and those of Scarlet Mimic, our team has not concluded that these groups are one in the same. The information discovered by Unit 42 and shared here indicates Scarlet Mimic is likely a well-funded and skillfully resourced cyber adversary. Scarlet Mimic has carried out attacks using both spear-phishing and watering holes since at least 2009 with increasingly advanced malware, and has deployed malware to attack multiple operating systems and platforms. Despite the apparent technical acumen, their decoy documents are typically not well crafted regardless of the use of the target’s language, though they do use timely subject lures. Palo Alto Networks customers are protected from Scarlet Mimic attacks through many components of our platform. Threat Prevention signatures for the software vulnerabilities listed in this report are available to detect the exploit files during delivery. Traps, our advanced endpoint solution, can prevent the software vulnerabilities listed in this report from being exploited on a Windows host. WildFire classified all of the Android and Windows malware described in this report as malicious. We have released anti-malware signatures for the files listed in this report. The domain names used for command and control have been classified as malicious in PANDB.